I have already written an article detailing how the birth, death, resurrection and the second coming of Jesus is an appropriation of the ancient traditional belief of the death, resurrection and the second coming of the Sun during the passages of seasons, here (Winter Solstice and Christmas – A Journey into pre-Christian Traditions). At Winter Solstice, now occurring on 21st December, the sun, as seen and felt from Earth, is at its weakest strength, giving us the shortest day and the longest night (in the Northern Hemisphere where many of the world’s ancient civilizations are situated). Hence the Sun’s passage through the Winter Solstice is celebrated in these civilizations of the world, as the death and resurrection of the Sun. From the Winter Solstice point, located in the apparent solar orbit in the sky of Earth, the Sun slowly moves to the Vernal Equinox (20th March) growing stronger, brighter and hotter which is in other words, the second coming of the Sun, i.e. its second orbit in the sky. But of course the Sun won’t stop at a 2nd coming or a 2nd orbit, but continue this cyclic motion making 3rd, 4th, 5th and many more revolutions and ‘comings’ (due to the revolution of Earth in its orbit around the sun). But the Abrahamic theology picks and chooses from this cyclic solar phenomena and attribute only one birth, death and resurrection to Jesus. It stops at the 2nd coming, ignoring the rest. This is much similar to the picking and choosing of Yahweh as the ONE AND ONLY ONE Abrahamic monotheist god, from among the many Gods and Goddesses like Asherah belonging to the ancient Canaanite pantheon. The Samkalpa of a solar deity or a Sun-God, undergoing death and resurrection is first expressed in ṚgVeda, in the story of Mārthānda, the 8th son of Aditi. The Samskrit term Samkalpa stands for the collective super-conscious expression of an idea or concept having a universal appeal, often wrongly translated to English as faith, belief or myth. This Samkalpa was later transposed to another son of Aditi viz. Mitra. The sons of Aditi are designated as Ādityās, the Vedic equivalent of Sun-Gods. The Sun God Mithra became popular in the Avestan and Roman literature as the god who was died and resurrected. In Abrahamic theology this Sun-God who died and resurrected turns into the ‘son of god’ who died and got resurrected. A few centuries ago Winter Solstice was occurring on 25th December. This was the reason why the birth of Jesus was fixed at 25th December. It is possible to calculate approximately when this date was fixed as the birth of Jesus, since it is possible to calculate approximately when the Winter Solstice was occurring on 25th December. The Winter Solstice shifts its position in sky by 1 degree in approximately 72 years. Thus it takes 25,920 years for the Winter Solstice to make 360 degrees or one revolution in the sky. This period is known to the modern science as the Period of the Precession of Equinoxes, its exact modern value being 25,776 years. The precession of equinoxes occurs due to the precession of the Earth’s spin-axis. This is also the time we arrive at if we add up one ascending Mārkāndeya Mahā Yuga of 12,000 years and one descending Mārkāndeya Mahā Yuga of the same duration, with an interval between them. Mārkāndeya Mahā Yuga is mentioned in the Mahābhārata. It is a suitable time-scale to locate human activity in Bhāratavarṣa since 12500 BCE, fully covering the Holocene period, in which we are now living. Since there are 365.25 days in a year (or approximately 360 days), 1 degree shift in the position of Winter Solstice in the sky is same as a 1 day shift in the annual calendar of 360 or 365.25 days. The ancients knew this correspondence between the sky and the annual calendar. They also knew the secret of the precession of the equinoxes. Since there is a difference of 4 days from December 25th to December 21st, we can calculate that Winter Solstice occurred on 25th December around 288 years ago i.e. in around 1729 CE. In Armenia, the Christmas is celebrated on 6th January, the remnant of an older Christmas date, made to coincide with the Winter Solstice when it was occurring at 6th January. In our calculation this will be around 1152 years ago i.e. in around 865 CE. The Orthodox and Coptic Churches celebrate Christmas on 7th January, which is the remnant of the oldest extant Christmas date, made to coincide with the Winter Solstice when it was occurring at 7th January. In our calculation this will be around 1224 years ago i.e. in around 793 CE. Thus we have seen that there was never any fixed date of Christmas. The Church occasionally shifted the date of Christmas to coincide with the Winter Solstice, as it shifts slowly in the annual calendar (as well as in the sky) due to the precession of Earth’s spin axis. This shifting of Christmas was done as part of appropriating the world-wide celebration of the Winter Solstice that were observed in the different ancient cultures in the northern hemisphere, in Asia, Europe and North America. The Church also openly admits that the exact date of birth of Jesus is unknown. The clues about seasons mentioned during the birth of Jesus rules out a winter season and indicates that he may be born in warmer climates, in summer or in early fall that are now experienced in March and April . Hence what the world wide community has to do now, is return back to the roots and celebrate this season of Winter Solstice as the festival of the sun-gods or the festival of the Ādityas. ṚgVeda mentions about the 7 Ādityas as Varuna, Mitra, Aryama, Bhaga, Amśa, Dhātri and Indra with Mārthānda as the 8th. Another name of Mārthānda is Vivasvat. Later Vishnu was added to the list making it 9. Finally the number became 12 and listed as Varuna, Mitra, Aryaman, Bhaga, Amśuman, Dhāta, Indra, Vishnu, Puśān, Tvaṣta, Parjanya and Vivasvat. These 12 Ādityās preside over the 12 divisions of the sky. 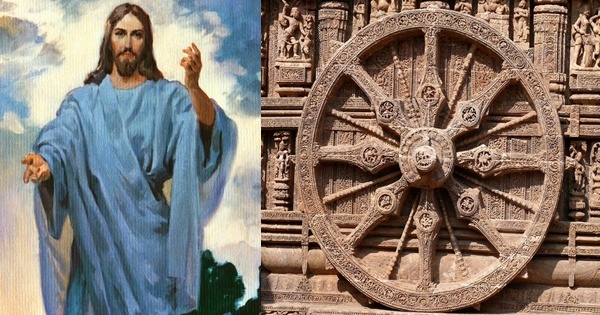 The sky with its 12 divisions is mentioned in ṚgVeda as the Kālachakra, which is conceived as a giant wheel-of-time or as a giant natural sky-clock where the sun acts as its ONE AND ONLY ONE dial. The three motions of the sun, viz. -1. its daily motion (containing sunrise and sunset) due to the rotation of Earth on its own axis, 2. its annual motion (containing Uttarāyana and Dakshināyana, viz. the annual northern and southern movements of the sun) due to the revolution of Earth around sun and 3. its motion due to the axial precession of Earth (containing the ascending Mārkāndeya Yuga and the descending Mārkāndeya Yuga, taking a total of around 25,920 years) can be deciphered from this Kālachakra (the Earth’s natural sky-clock). This was well known to the ancients. Which Āditya needs to be celebrated in which day can also be left to individual choices to provide some flexibility or it can be synchronized pan India or world-wide with some guidelines and consensus arrived at through different traditional communities. Waking up early in the morning and observing the rising sun with prayers made to the Āditya chosen on that day, needs to be part of the ritual that can be easily observed by all practicing Hindus willing to celebrate the 12 day Āditya Festival. Apart from this, other Pūja and prayers can be performed in temples or in individual houses by the Purohitas. In order to rekindle this 12 day Āditya Festival, the Hindu tradition needs to celebrate the Uttarāyana at 21st December, which is when true Winter Solstice occurs today. Many rituals meant for celebrating the Winter Solstice are now celebrated during the Makara Samkrānti in January 14th. These needs to be shifted to 21st December. Winter Solstice coincided with Makara Samkrānti 1728 years ago, i.e. in around 289 CE. Our ancient Ṛṣis’s intent for celebrating Makara Samkranti was to celebrate the Winter solstice and thus to celebrate the death, resurrection and rebirth of Mārtānda symbolizing the lowest solar heat and light felt during Winter Solstice and the subsequent rise in the heat & light, post the Winter Solstice day. By not shifting celebrations from January 14th to 21st December, the Hindu tradition too is in the same state of the Church which can’t shift Christmas from 25th December to 21st December even though Winter Solstice has now shifted from 25th December to 21st December. Traditional scholars are seriously discussing this issue and it is hoped that this will be soon resolved. The festival of Ādityās will then begin soon resulting in the spiritual renascence of this world which is now witnessing a collective spiritual ascend! Featured image courtesy: Beliefnet and Pinterest. 1. Nalanda: 9 Million Books Burnt in 1193 by Bakhtiyar Khilji. Jijith Nadumuri is a former scientist of ISRO who worked as part of the Chandrayan 1 study phase currently engaged in the research of geographical data present in the Mahābhārata. In this capacity he has presented many papers in various international conferences. He owns the web-portal AncientVoice. He is an artist and has visualized many scenes from the Mahābhārata which was exhibited in different conference venues. Combining this expertise with software technology he is engaged in creating Virtual Avataras of Itihāsa personalities in Virtual Reality, Augmented Reality and Artificial Intelligence.